Perhaps as a result of the impact of meeting Peter Korn in November 2015 at the meeting of NEMA (New England Museum Association) and then reading his book Why We Make Things and Why It Matters (David R. Godine, Publisher ©2015) in January, I have been steeped in reading books that reveal and explore the passion and spiritual richness of people who work with wood. Two other such passionate books from the winter (long periods of darkness and gloomy, cold days are not balanced by a too-steady diet of evening TV in mid-coast Maine) are George Sturt’s The Wheelwright’s Shop (Cambridge University Press ©1963) and Richard Sennett’s The Craftsman (Yale University Press ©2008). Also this past winter, I read (actually listened to – I am an addicted audible book listener in my shop and car) David McCullough’s The Wright Brothers (Simon & Schuster: ©2016). All four of these books represent the deep feeling for history, craft excellence, and exceptional accomplishment described many years ago for me by my artist wife’s guiding admonishment to our sons: “Life is too short to use poor materials or bad ingredients.” Time (life) is far too valuable to squander on anything less than performing at the highest level of excellence with a commitment to always improve to a new level. 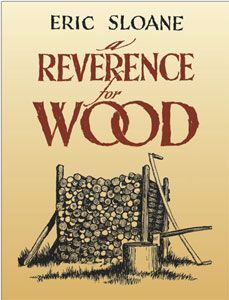 My first plan for my summer woodworking reading is to go back in time to re-read Eric Sloane’s A Reverence for Wood (Ballantine Books: ©1965) and Museum of Early American Tools (Ballantine Books: ©1964). I remember reading these in the late ‘60’s and being tremendously filled with admiration for Sloane’s intensive research into the history, use, and spiritual connection to wood and the tools we work it with. I believe that at this point in my life I will find Sloane even more relevant and compelling. This must be why I have treasured these volumes all these years. Michael Ruhlman’s Wooden Boats: In Pursuit of the Perfect Craft at an American Boatyard (Penguin Books: ©2002) is high on my list for this summer and new to me. As a woodturner, I am frequently asked to turn one or two replacement fixtures for wooden boats, and when I do, I feel a special connection to the boat and its journey. Boatbuilders, like woodturners, share a fascinating relationship with the fluid sculptural shaping of various types of wood as they practice their craft, sometimes weaving the wood with its bends and twists into a shape both beautiful and useful. The passion for excellence that I suspect Ruhlman will describe in his book derives from the core example set by Joel White in Douglas Whynott’s A Unit of Water, A Unit of Time: Joel White’s Last Boat (Washington Square Press: ©1999). The driving energy of an exceptionally talented master of his craft to always seek to improve and to discover the magic balance of creating something impressively efficient by developing its beauty reaches the inner core of the creative spirit guided by years of expert and brilliant experience. Uniquely, wooden sailing craft link us to our ancestors, and the correlation between woodturners and sailors is naturally and understandably high. As a coastal Mainer, I schedule a regular time for my reading and creative reflection in the late summer afternoons in our home as a retreat from the excess of vacationers from the south and travelers from around the globe. Although I am a regular book-listener (audible.com) in my shop, I also enjoy holding the physical volume and turning the actual pages of a good book late in the evening. Another similarly reflective and inspiring opportunity for me is to explore the talents of others in boat building and handling as presented by the folks at www.offcenterharbor.com. These video chronicles document the experience, knowledge, and skills of the talented men and women who dedicate themselves to beautiful boats and sailing. 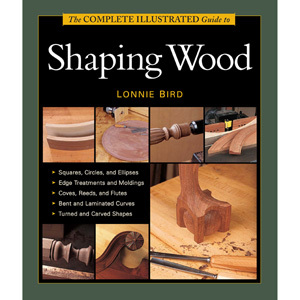 Lonnie Bird’s Shaping Wood (Taunton Press: ©2001) will be the groundswell of practical application for the summer. When standing with a new piece of freshly green wood and newly sharpened tools at the lathe, the creative vision challenges the practical reality of what I can achieve as a craftsman. The elusive ideal form seems forever just beyond my grasp, and the challenge fuels my effort. Readers of this Highland Woodworking blog can appreciate the spiritual connection many of us are fortunate enough to have with our materials and tools through the deep sensuality of combining touch, smell/taste, sight, and weight with the imagined vision of a finished piece as wrought into reality by the touch of a master craftsman’s skill. Find more great Woodworking Books and Plans at the Highland Woodworking website.